Want to help out from home? Visit these great sites to find out how. Sharks have existed even before dinosaurs! The largest ray in the world is the Manta Ray that can grow to over 7m wide and weigh over 1.5 tons by eating only tiny plankton! The largest shark is the whale shark that may grow up to 21 metres long. Lantern Shark have the longest gestation of any animal on the planet, for 2.5 years she is pregnant. The fastest shark is the Short Fin Mako Shark, which can swim fast enough to catch Tuna and Swordfish. Not all rays are stingrays, the Fiddler Rays and Shovelnose Rays (also many others) do not have barbs. The most harmless sharks tend to be the largest, such as the Basking Shark, the Whale Shark and the Megamouth Shark. The skin of a ray is entirely smooth except for the back or upper tail surface, where dermal denticles have developed into large, strong spines. Sharks will often eat each other. 70% of Australia’s rays are endemic, this means they are not found anywhere else in the world. Like sharks, rays don’t have bones, their skeleton is made up of cartilage (like your ear). Some sharks can have up to 3,000 teeth at any one time. Myths about sharks having poor eyesight are totally untrue. They have good vision and added capabilities such as night vision and additional receptors to monitor movement in the water great distances away. Rays are naturally inquisitive animals but their first reaction is to flee any disturbance. Two thirds of a sharks brain is dedicated to its sense of smell. Over 100 million sharks are killed by humans each year (some say as many as 400 million). 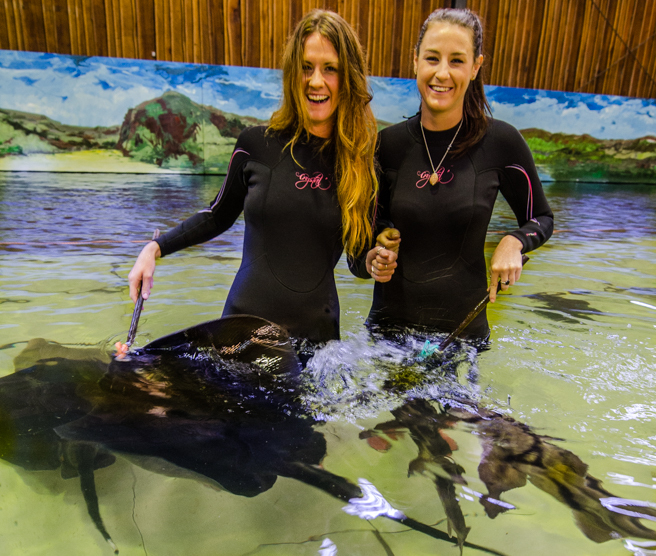 When they feel safe, rays will often brush their fins past objects they come across. Stingrays come in lots of sizes, some as small as the palm of your hand, others are 8 feet across! (That’s the size of a small car! ).